Many people say Indian food is difficult to cook not because of the technique, but because of the difficulty in locating many of the necessary ingredients. The Chaunk 8 Pack includes all the hard to get spices needed to cook any of the enclosed recipes and a lot more. Just combine them with a few of the more common spices found in most kitchens. When I first started cooking Indian food twenty-six years ago, I had the advantage of living in Los Angeles where every ingredient I needed was readily available from local Indian markets. When I moved to Sonoma, this was no longer the case. Which is why I developed The Chaunk. 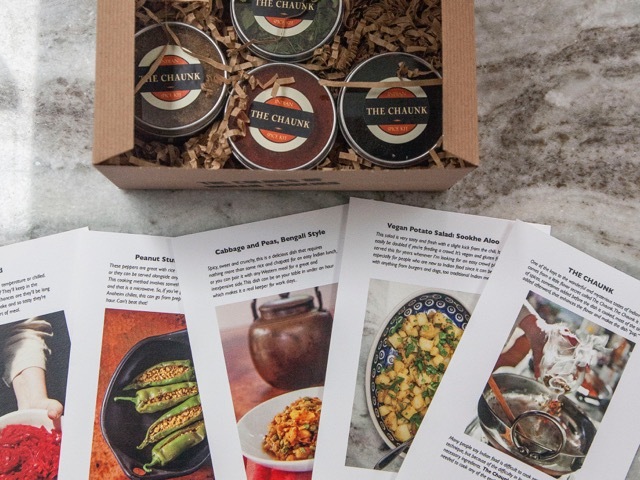 The Chaunk enables anyone to open the box and immediately begin the adventure of cooking Indian food. The recipes included in The Chaunk are simple and delicious vegetarian dishes, great for people taking their first steps into Indian cooking. They are all favorites in our house, easy to prepare, and healthy. They can be part of an Indian meal or can be prepared on their own to accompany a western menu. And of course, these spices can be used to prepare many Indian dishes. Click The Chaunk and see what we've got cooking.